Jerry J. Cohan, of the Four Cohans, commenced his career when he was a boy about sixteen years old. He was a dancer, and in those days considered the champion clog dancer of the country. Mr. Cohan travelled with the Harrigan Hibernica Company, and besides doing his dancing specialty, also lectured on the panorama used in the show. They played many cities and towns from the Atlantic to the Pacific and seldom overlooked a “stand,” whether it was on the map or not and even if obliged to play in the school house. In relating his experience Mr. Cohan tells of many funny incidents that have happened en route; one in particular is concerning the town of Middleboro, Mass., where it is alleged the author of the “Country Circus” got his idea for that once famous play. “There were about fifteen people in our company,” relates Mr. Cohan, “and we were all obliged to stop at one hotel. At the dinner table all our company had been seated, including Mrs. Cohan, when I appeared in the dining room, and the landlord’s daughter, who was head waitress, assistant, and, in fact, the entire force of waiters, insisted ‘that I set at a separate table.’ I did. The Four Cohans, photograph, 1888. 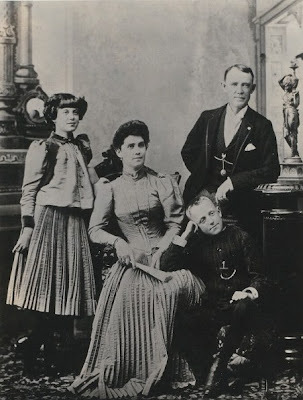 The photograph depicts Jeremiah and Helen Cohan with their son George M. and daughter Josie about 10 years after Mr. and Mrs. Cohan visited Middleborough. The foursome would later become nationally famous as the "Four Cohans", and Jerry would draw upon his experience in Middleborough when performing the country "rube".